You are currently browsing the tag archive for the ‘City of Sydney Council’ tag. 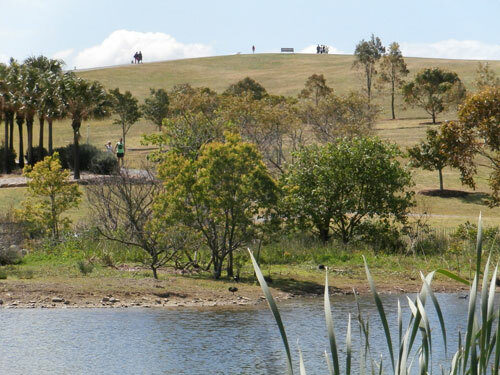 The City of Sydney Council has done much to make Sydney Park a truly excellent park. From its history of being brick pits to a garbage landfill dump, it has been transformed into a sparkling jewel in the Inner West. Nothing is stagnant in this park. Every time I visit I see changes. There is always new growth & new trees planted. The council seems to plant trees all year round. New public art appears, as do extra features, extra seats & new areas of plant cultivation. It’s an ever-changing landscape that I know is much appreciated by those that frequent this park. I am not alone in thinking Sydney Park is special. This will be a multiple set of posts because there is a lot I love about this park. No n sightlines here, except for along the path, yet no-one is scared. It is great to see real habitat like this, especially so close to the city. I stood here and counted 11 species of tree in this one location. The trees – Instead of the usual fare of trees around the periphery or in patterns or rows, trees are everywhere. 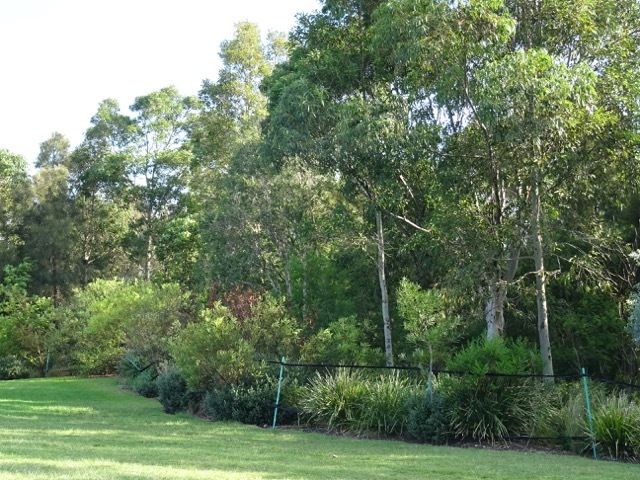 While there are large expanses of lawn, it appears to me that the City of Sydney is planning for biodiversity & shade. There is no shortage of places to sit underneath a shady tree & you don’t need to be on top of each other to find this. 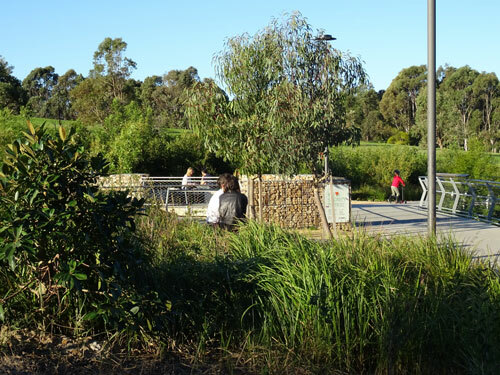 This is helped by the size of the park – a whopping 44 hectares, but the landscape design has obviously made strong decisions to allow people to find spaces alone or with others. There is plenty of choice. There is a huge variety of native trees, which produce food for wildlife. There are also hundreds of Fig trees, which when mature are going to look stupendous. Some were planted recently, while others were planted when the park was opened in 1991 or soon after. Throughout the park are mini forests with thick understoreys that are filled with chattering birds. Casuarina are not the dominant tree & have been kept in one forest. The two National Tree Day planting sites are developing well. It is really pleasing to see such large expanses transforming into forested areas when one has participated in the planting of these. I love that there are trees outside the perimeter of the park, around the perimeter & also in areas all through the park. Trees are a major feature of this park & for me it is excellent to spend time in such a heavily treed park. 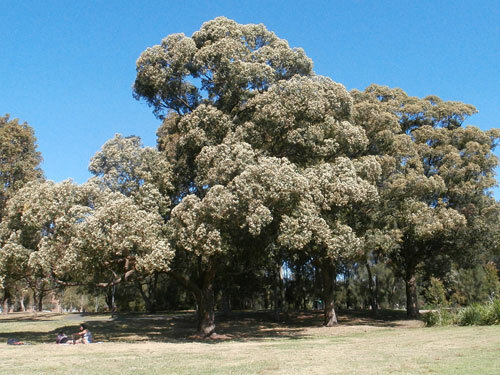 There are some gorgeous trees in Sydney Park, even in the car park. I also really like that the trees are so thick in the area opposite the roundabout that you cannot see into the park in this area. I am used to see-through parks, where you can see the cars where you are & cars at the opposite side of the park & hear them as well. Even at the edges of Sydney Park, there are areas where you can feel like you are away from roads & traffic. Peace is a big aspect of Sydney Park. The understorey – It is obvious that much planning has gone into creating an understorey to create viable habitat & improve biodiversity. Instead of what we see along the Cooks River where small groups of trees have been thinned out & the understorey removed to provide absolute visibility from one side to the other, the City of Sydney Council seems to be unafraid of areas where sightlines are poor. There are multiple shrubs, grasses & other plants growing under the many trees creating areas of thick, lush & viable habitat that must improve biodiversity by providing safe areas for wildlife. People don’t appear to be afraid of these bushy areas either. I’ve seen many women walking alone or with a young child. People seem to respect these areas as well. I have never seen people destroying these areas of bush. That many areas are loosely fenced off may be helping by sending a subtle message to keep out. Areas of recent regeneration are more formally fenced off with signs explaining why. There is quite a bit of educational content in these signs as well. One of the National Tree Day sites in Sydney Park – lovely thick understory lightly fenced off and respected by the community. 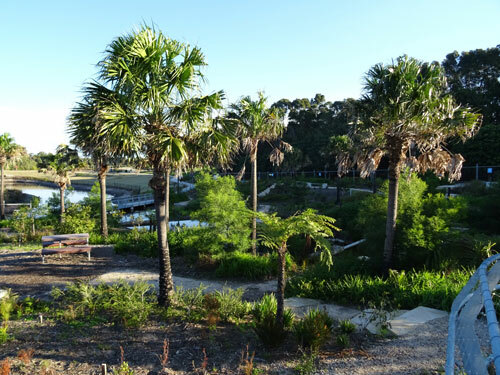 No graffiti & very little litter – I’ve long believed that if a place is beautiful, people will respect it & I think this is happening at Sydney Park. There is litter, but it is not obvious, nor is is much. Tree trunks have not been tagged, nor have other structures like buildings, seats or paths, as far as I have seen. I have not seen tree bark gouged out with people’s initials either, except on one very old Fig tree & this probably predates the formation of the park. 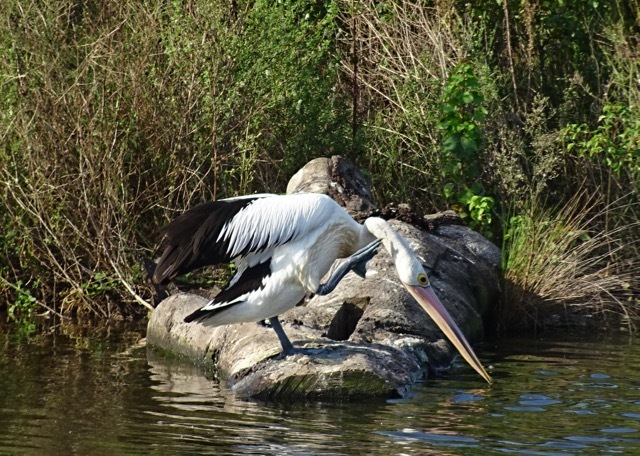 The ponds – Central to Sydney Park is its pond system, which collects stormwater from the local areas, cleans it & creates a fresh water haven for waterbirds & other wildlife. Three ponds follow the slope of the land, while a fourth pond is tucked away in the lower corner surrounded by a circle of thick trees. The stormwater harvesting system began in early 2013 & although already looking fabulous, is still a work in progress. 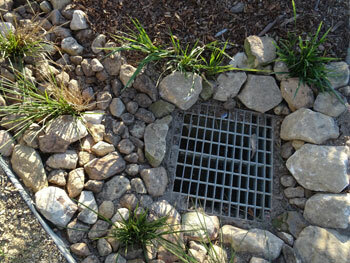 Around 850-million litres of stormwater is captured & cleaned every year. 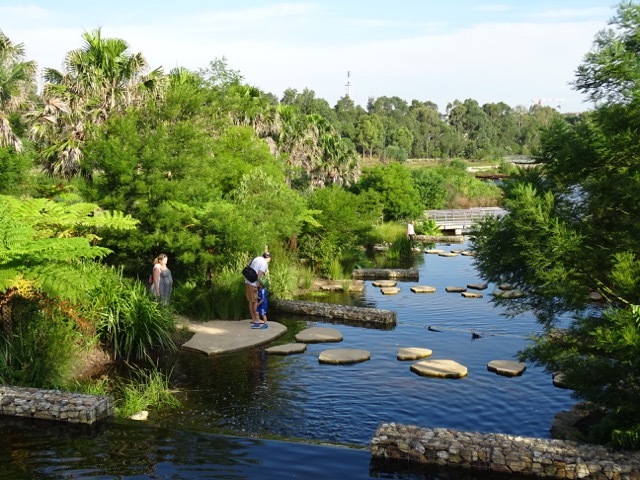 A bio-retention system collects water & filters it through plant roots & soil before it enters the ponds. Water is also circulated to stop it going stagnant, creating a living vital space for wildlife. The ponds themselves are beautiful creations & even more beautiful since the wetlands were added & planted last year. There are a number of cairns that might offer homes for insects & lizards, while big logs & wooden piers offer natural perches for waterbirds. The island has been left to grow wild, which is fantastic for the birds. Dead trees have been placed hanging over the water, again offering a natural place for waterbirds. 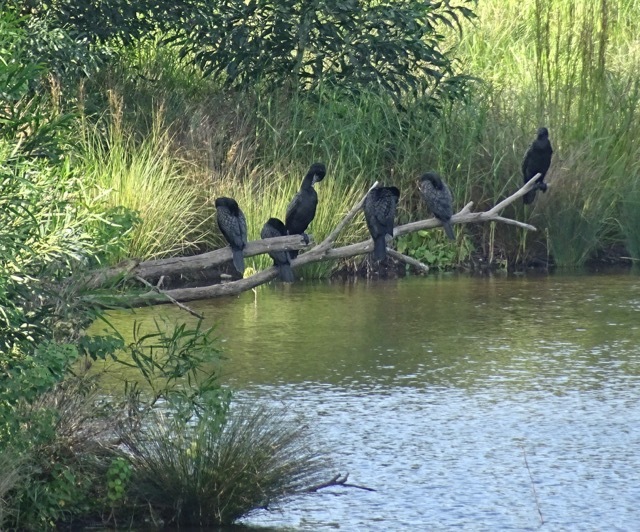 Last week half a dozen little black cormorants were perched on one proving my point. There are areas of thick reeds for nesting & for eating. I love the viewing stations that allow people to interact with friendly waterbirds who come for a look. I also love the new area where the water travels down the hill that has stepping stones allowing people to walk across the water. This area is lush with plants & is exceptionally beautiful. This area is exceptionally beautiful in my opinion. It is new, so will only improve as the plants and trees grow. I was admiring the artful placement of this log when a pelican hopped up and had a scratch. Habitat for wildlife. On the left you can just see a wren perched on this log. 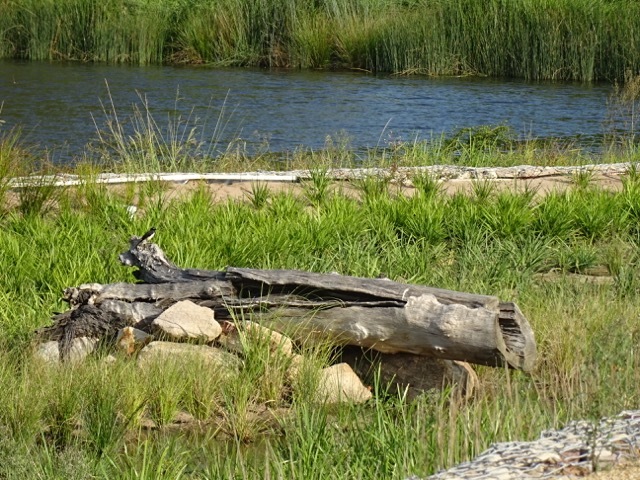 This log is one of many placed in the new wetland areas. 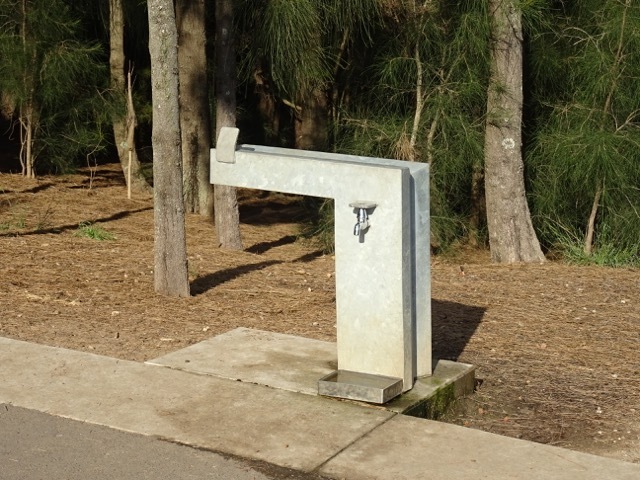 Water for birds – It’s not hard for a bird to have a drink in Sydney Park. As a result, there are lots of birds because it is a nice safe place to live. There are lots of water bubblers scattered around the park & they all have a bowl at the bottom, ostensibly for dogs to have a drink, but it is not unusual to see birds drinking from this bowl either. To me not having access to fresh water for birds in parks is cruel & goes against every attempt to improve local biodiversity. Councils can have statements & biodiversity policies, but if there is no fresh water available for wildlife in parks & along biodiversity corridors, then this is a token approach in my opinion. Every living beings needs to be able to have a drink, including birds, insects & lizards & they need better & more reliable access than stormwater drains & puddles. It’s only a water bubbler, but the water bowl at the bottom can mean life for a bird or other small animal. Plus there are many of these throughout the park. Part of the central path to the fountain installed in 1889. The Canary Island palms are the tallest I have seen. Some of these veteran Canary Island palms have a bend, which I think is rather nice. 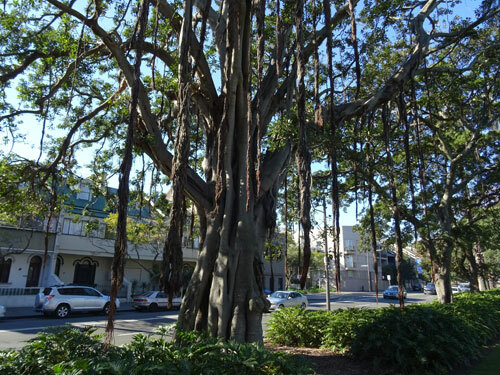 Magnificent veteran Fig with incredible aerial roots. Two thirds of this tree is not in the photo. After decades of driving past & wishing I could stop & go inside Redfern Park, today I finally did & boy, it was well worth it. 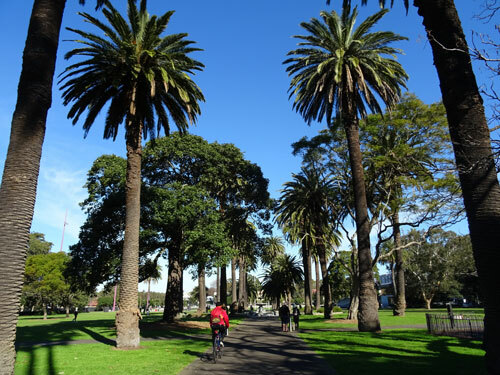 A bit of history – prior to 1885 the land that became Redfern Park was deemed “a dangerous ‘pestiferous bog’ known as Boxley’s Lagoon.” In 1885 Redfern Council (now the City of Sydney Council) gazetted the 12-acres to form Redfern Park. It was designed as a “Victorian pleasure ground” & thankfully, retains much of this feel today. The park is surrounded by truly magnificent Fig trees. Many have incredible aerial roots that hang down to within a 1.2 metres from the ground, while others have a canopy spread of around 20-metres. There are also Cabbage & Canary Island palms at the impressive sandstone entrance gates & also in lines throughout the park. There is a massive & perfectly shaped London Plane tree showing how regal this species can look when it doesn’t need to be pruned for powerlines. There is also a gorgeous River Red Gum that makes me think of Central Australia. With today’s blue skies it was easy to imagine this. Much to my delight there is also a Bottle tree. 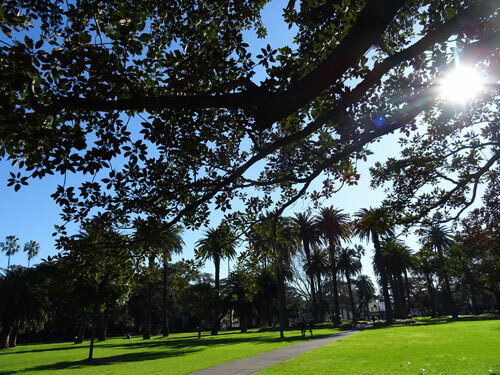 This list of the registered significant trees in Redfern Park came from the City of Sydney website – see http://bit.ly/1mrY8I9 I must say it is wonderful to be able to find out details of the trees planted, their history & significance. 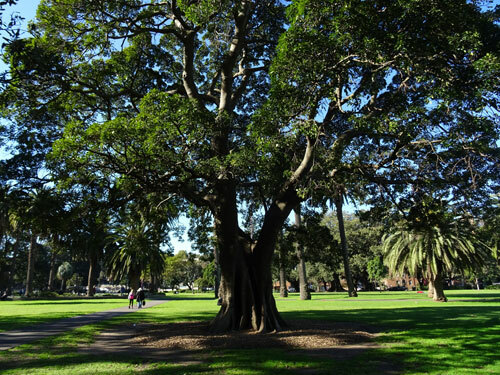 There are a whopping 86 protected significant trees in Redfern Park making it a jewel less than 2-kms from Sydney CBD. Part of the park includes Redfern Oval – home of the South Sydney Rabbitohs Rugby League Club. There is succession planting of both Fig trees & Canary Island Palms surrounding this oval. The roof of the stands of the oval is covered in solar panels – another good thing to see. Showing the historic gates & a gorgeous residential street beyond. Look at that canopy & lush verge gardens. I bet it is a great street to live in. The oval has multiple large gates that when closed form a fence. However, they were open to allow the public access to the oval. People were all through this park & oval & it was obvious that is a popular place to spend some time. There were dogs both on leads & leash-free. People were picnicking in the centre of the oval while others walked or ran. To me it was great to see this area opened for use of the public. There was one barbeque facility & people were cooking while we were there. 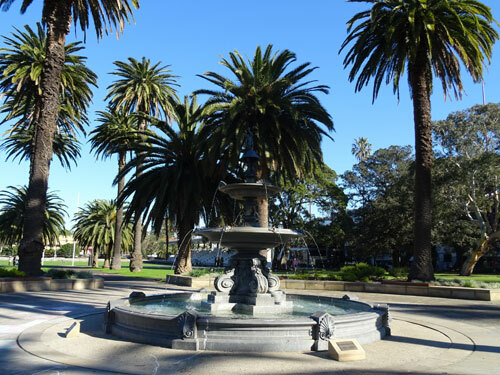 Inside the park is a gorgeous ornate fountain that was installed in 1889 & refurbished in 1991. The fountain area is a delightful & peaceful place to sit & watch the water & passersby. The fountain also provides an important water source for the many birds that call this park & local area home. Water in a public park was very pleasing to see. I wish other parks also provided fresh water for birds. There is also a well-maintained & attractive war memorial that was erected in 1919 to commemorate 137 local men who lost their lives in the First World War 1914-1919. The children’s playground was simple, but lovely. Rather than all the entertainment coming from the playground, children were running around the park & exploring. Close-up of the water sculpture called “Lotus Line’ designed by Fiona Foley. It’s utterly gorgeous in my opinion. 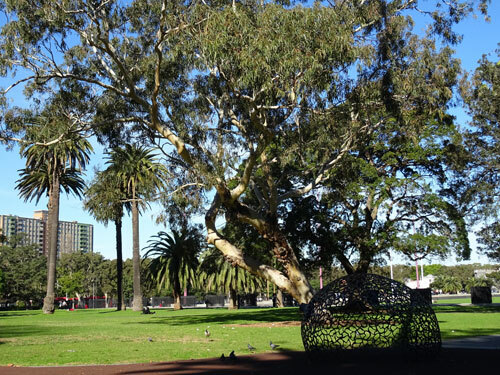 A marvelous feature in this park is a water sculpture called “Lotus Line’ designed by Aboriginal artist & academic Fiona Foley. Multiple lotuses stand tall & around these shoots spouts of water. It is a waterplay park with a difference & still spouting water in winter. Kids were playing ‘karate chop’ with the waterspouts & able to do this without getting wet. I imagine it is a different scene on hot summer’s days. 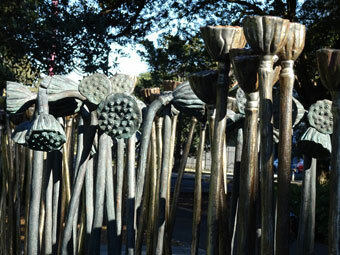 Ms Foley also designed large seedpods & other sculptures for the children’s playground. Kids can enter or climb these art works. They were very beautiful to my eye & rather than detract from the surrounding landscape, added another almost secret dimension. 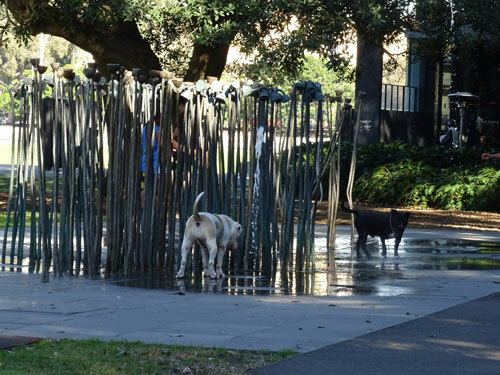 Her artwork in Redfern Park is very nature-orientated, which I think is a good thing as it engages children’s consciousness & hopefully makes them more respectful of the environment. One other thing that I found impressive & smart on Sydney City Council’s behalf was that all the garden beds were planted with the one plant. I think it is called Philodendron ‘xanadu,’ though I may be wrong. The wide garden beds around the periphery of the park & under the trees were thick with this lush plant & they served to block out much of the sight of the busy passing traffic. Mono-planting if done well, as it is in this case, can look terrific. There were no empty garden beds or areas that looked dead or only covered with mulch. The garden beds also served to provide a safe habitat for any ground dwelling wildlife. Also, most trees in the park were surrounded by a generous ring of mulch, so no chance of injury from a whipper-snipper or lawn mower & also very good for the continuing health of the tree. 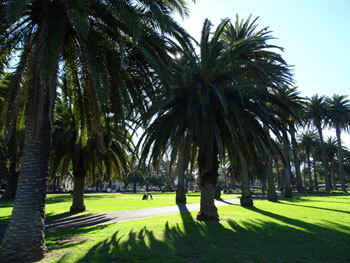 Another view of the Canary Island Palms, this time from the south side of the park. What I found astounding was the lack of litter in this park. There were no cigarette butts, drink cans, bottle tops & other litter, even under the trees & in the gardens. I saw one bottle & a couple of tissues in our two-hour stay & the park was full of people. A colony of Australian White Ibis lives in the park & not a sigle one of them has leg injuries from discarded string or the like. What makes one section of the community treat their park well, while another a short drive away thinks nothing of leaving everything they don’t want behind? I don’t think I will ever understand this. There was no evidence of any kind of vandalism either. All the newly planted trees were left untouched. No tree trunk was spray-painted. Neither were the historic sandstone entrance gates, bench seats, bins or other structures. The fountain looked new, not 126-years-old. Respect for the environment is obvious in this park. Redfern Park is special. I highly recommend a walk on a sunny day to take in the delightful sights of so many magnificent trees & the other wonderful aspects of this marvelous park. Don’t wait decades like I did before you take a step back into history when parks were elegant places for promenading & people watching. Casual clothing is accepted these days, but probably not in the 1880s. I would give Redfern Park ten stars for beauty, ambience, amenity, art, sport, community & peace. An incredibly lovely Victorian fountain that not only looks beautiful & sounds peaceful, but is also a fresh water source for local birds & other wildlife. Seatung surrounded the fountain. One of the magnificent trees in Redfern Park. Everywhere one looks there is beauty. Phenomenal Red River gum in the background with one of the artworks by Fiona Foley. This one could be climbed or entered. Sublime Fig tree in Redfern Park. Note the landscaping that protects the trees, adds beauty & habitat, but also separates the park from the street beyond. Looking twards the centre of the park from under a massive canopy of a veteran Fig tree. The ‘Lotus Lines’ water scupture was enjoyed by myself, a meditating man, some children wo are just visible inside & these dogs. View of part of the new works looking up the hill. The cascade area with permeable paths & seating scattered throughout. We went to Sydney Park last weekend after a gap of a few months. The changes are astronomically good. 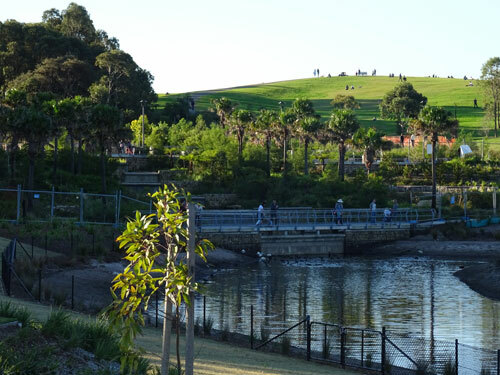 No wonder City of Sydney Council has been awarded a Green Flag for Sydney Park. They deserve it. 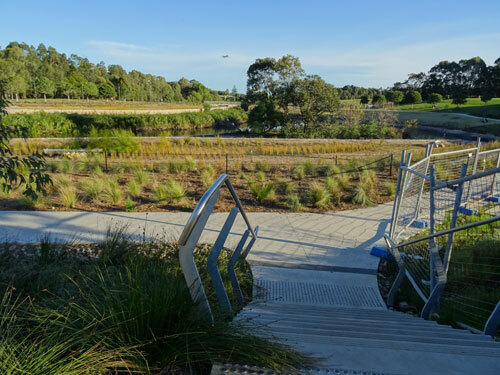 Sydney Park covers 44-hectares & a fair section of the park consists of a series of swales, ponds & lakes, that together harvest stormwater from surrounding streets. 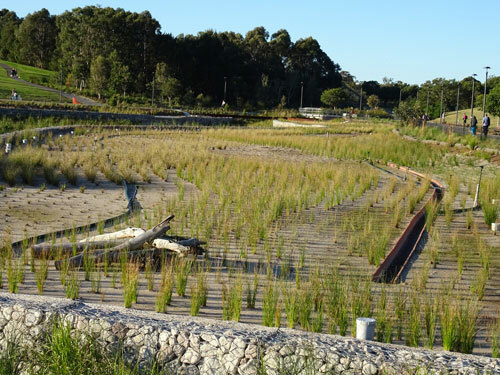 The harvested stormwater will be used to irrigate the park & top up the wetlands. The Water Reuse Scheme commenced in April 2013 & appears to be nearing completion. The works will cost $10.5 million & harvest & clean a massive 850-million-litres of stormwater per year. Even the work around the drains looks attractive. & taken through pollutant traps & series of bio-retention beds to filter & clean it from all sorts of pollutants, such oil from roads. The water then travels to a retention pond that gradually fills the four lakes & wetlands further down the hill. All this provides a wonderful habitat for a range of wildlife, especially waterbirds. Harvesting stormwater is not only sustainable, but also works towards preventing flooding in areas outside the park. You only need to look around to see the extent of works done by City of Sydney Council around this project. There are many swales that travel beside the pathways throughout the park. Even when there is not a swale beside the path, there is a groove at the side of the path that channels water to swales & then to small ponds or wetlands. The ponds & wetlands serve to clean the water before it reaches the lakes. They are fabulous little spots of biodiversity & very nice to look at. Paths meander down to this new watercourse. It looks to be that people will be able to cross on these sandstone platforms. It’s very beautiful. The large swale that was defined by the Cabbage palm trees is now a watercourse. I was pleased to see that the the palms were retained. A great deal of work has been done here. Thousands of plants have been planted. 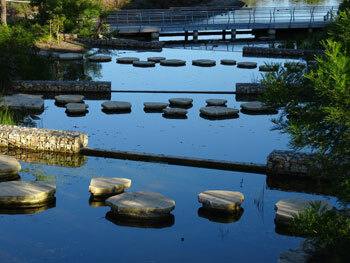 There are large wetland areas, new attractive seating, permeable paths, lookouts & areas where one can quietly reflect. Gabian walls are used everywhere. They not only look attractive & act as retaining walls, but also provide habitat for insects & lizards. The problem of dogs killing the black swans has been permanently fixed by fencing. The Council has chosen fencing that is not intrusive to the eye. It will keep both dogs & humans out, which is very good. A dog water station is being installed for the dogs to cool off. Every piece of furniture – seats, tables, benches, fencing, railings, bike racks, lighting & bins – is attractive. City of Sydney Council has chosen carefully for durability & aesthetics. These things make the park very attractive to me. There are newly planted trees everywhere & they all seem to be Australian natives. 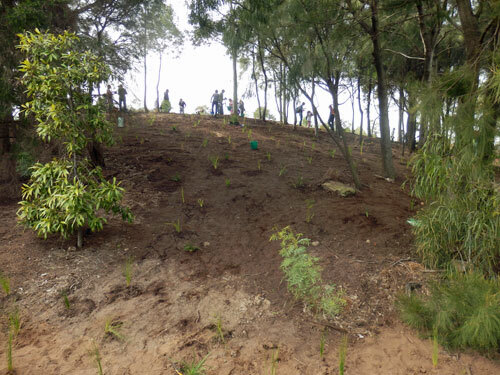 Trees are planted in groups together providing safer habitat for wildife & more visual impact for people. The trees also act as a wind break, as well as offer shade. I did not see one seating arrangement that did not include one to three shade trees planted around the seating. There is lots of seating dotted everywhere, especially where there is a nice view. Huge log surrounded by vegetation offering good protection for wildlife. 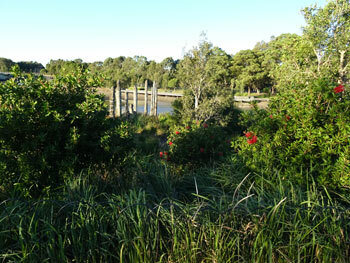 Everywhere are islands of dense planting, all with a variety of Australian native plants. Native grasses are used, but they are not the main plant used. Many of the bushes were in flower providing food for wildlife. Large logs are left in areas surrounded by lots of plants. An animal could be standing beside the log & you would likely not see them. 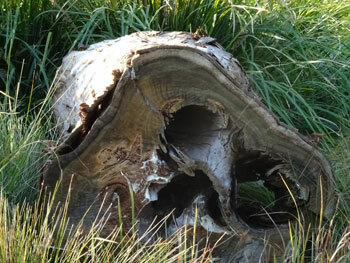 Dead wood is great to leave in the environment. Another thing we noticed was the lack of litter & the lack of coal fire barbeque smoke. There were no plastic bags flying around everywhere, no piles of coals, no balloons, string, toilet paper & other litter that I am so familiar with. Sydney Park was exceptionally clean. There was no graffiti either. This says to me that the community respects the beauty this park provides & with this respect comes a sense of responsibility. I wish this attitude could permeate all our parks. View from the bottom path. The poles have been here for years & birds are often seen perched on them. It is nice to see winter colour too. The emphasis has obviously been on creating a park that has much beauty & really is a refuge for both people & wildlife. City of Sydney Council does not seem to be concerned with sightlines, which I think is great. Unless you are at the perimeter of the park or on the hill, you cannot see traffic. The odd airplane flies across, but this only adds an element of interest. This park is a haven for both people & wildlife & something the City of Sydney should be exceptionally proud of. The trees are still young & are still being planted, so I can only imagine just how beautiful it will be when the hundreds of Fig trees for example, grow to maturity. If you haven’t been to Sydney Park for a while, I highly recommend a visit. There were thousands of people there last weekend, but the park is big enough to not feel crowded. There are many quiet places, as well as busy places like the playground – something for everyone. New walkway through & around the new wetlands. The original island was retained. The new wetlands are very large & surround the lakes. It’s obvious how much work has gone into creating these. Wildlife are going to benefit immensely. There are channels to bring in water, as well as irrigatuion pipes for when needed. The pile of logs will offer perches for the birds. Showing the first retention pond in the background. 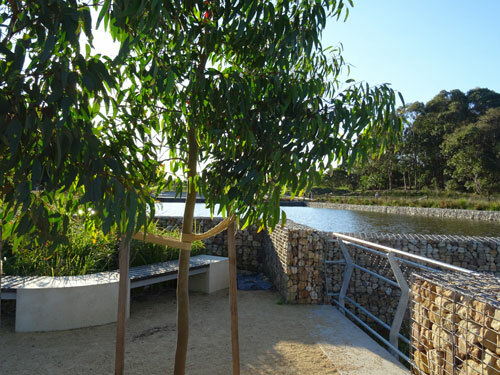 Note the nice seating, permeable path, attractive fencing, gabion wall & the new tree. Concrete is kept to a minimum. A range of seating offering privacy from others while surrounded by beauty & with a good view. At every opportunity islands of green appear. I think they look great. Mini islands of biodiversity. This is a common sight. The City of Sydney Council is once again leading the way by trialing reverse vending machines that accept empty drink cans & plastic bottles. These machines are already in use in Europe, Japan, China & Brazil. Dixon Street Mall in Chinatown. I think it is a brilliant idea. 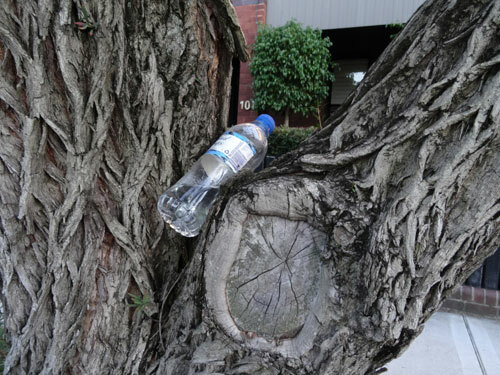 Beverage companies Coca-Cola Amatil, along with Schweppes Australia & Lion Pty Ltd won a Federal Court case against a Northern Territory container deposit scheme in 2013. There has been no evidence of agreeing to Cash for Containers schemes in the Northern Territory or elsewhere in Australia. South Australia has continued to run their scheme successfully. 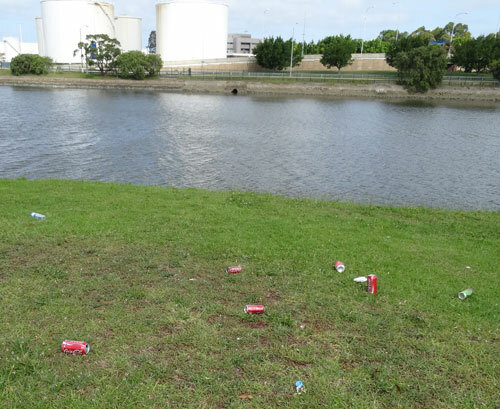 Even though there are only two machines in Sydney at the moment, they are removing drink containers that would likely have ended up as litter & in our harbour & waterways. Each reverse vending machine can hold 3,000 drink containers before needing to be emptied. I’d like to see them everywhere. Can you imagine the positive impact on the Cooks River if these reverse vending machines were all over Marrickville LGA & the other municipalities along the Cooks River? Maybe if these cans & bottle could win people something, they would put them in a reverse vending machine instead of leaving them to finally end up in the river. 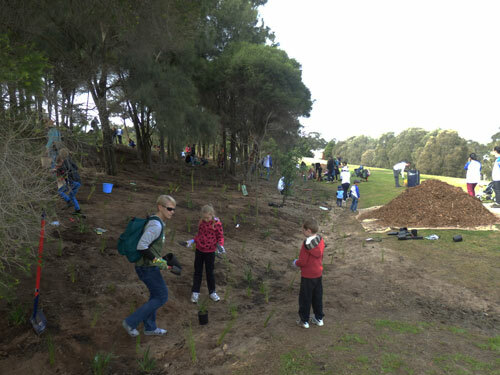 Today we joined around 1,000 people (staff estimate) of all ages to plant 4,500 plants in an area of around two football fields in Sydney Park. 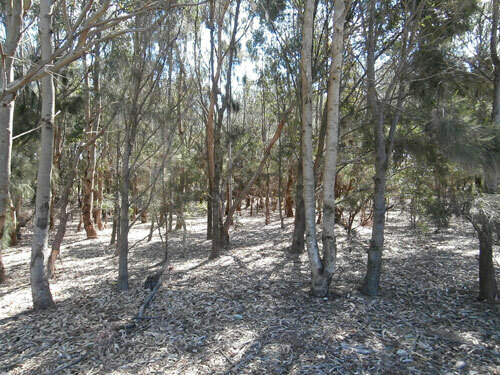 The plants were indigenous to the Sydney Basin were chosen to create an understorey, slow down stormwater, as well as provide habitat, particularly for smaller birds. Nearby areas with similar plants gave a good idea what today’s work will look like when the plants have established themselves. The City of Sydney Council, Planet Ark & their sponsor Toyota organized the event. There was an entertainment area centered around a stage & a series of tents. 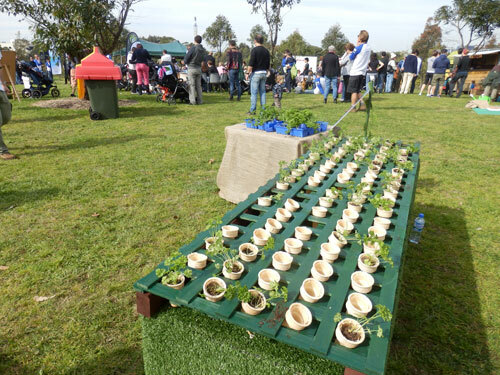 Registration gave participants the choice an ice-cream or a barbequed sausage roll/vegetarian pattie, a free ‘plant the container as well’ plant to take home & entry into a raffle. I’ve forgotten the prizes, but remember liking them at the time. We were also given an organic cotton ‘National Tree Day’ t-shirt. First there was a very nice welcome to Gadigal Country by an Aboriginal Elder whose name I did not catch & then other speeches from the Lord Mayor of Sydney Clover Moore, a representative from the sponsors Toyota & a representative from Planet Ark. 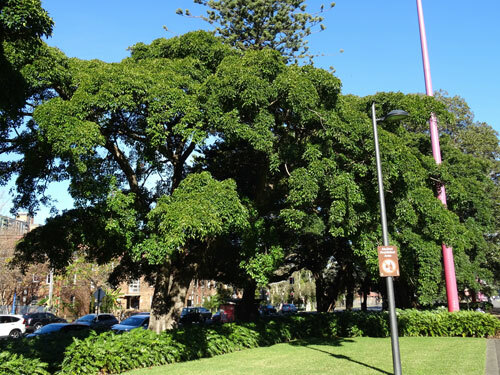 Lord Mayor Clover Moore planted ‘tree number 20-million’ since Planet Ark started National Tree Day in 1996. 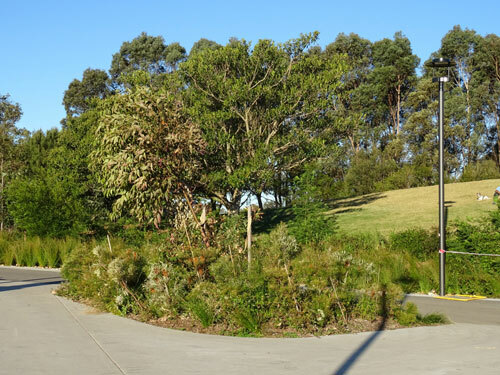 She thanked the community for all their help in transforming what was once a dump into Sydney Park with a tree canopy that is getting denser every year. 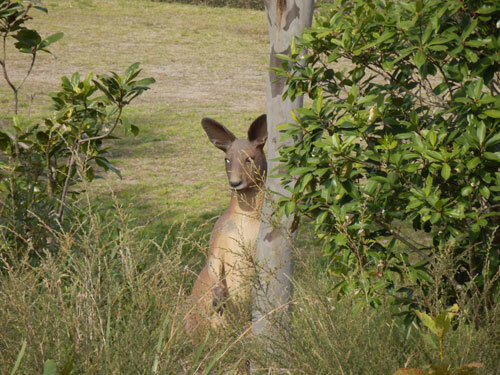 A realistic plastic kangaroo seen watching from the sidelines, much to the delight of the children. There were chickens & face painting for the kids, plus exhibits ranging from types of compost, vertical gardens, green walls & growing in a bag for those who don’t have much room. There was also yoga for families & demonstrations of DIY gardening. Because there were so many people, planting was done in four shifts to allow everyone a chance to be involved. Staff gave onsite training on how to plant & then took participants to the area to be planted. 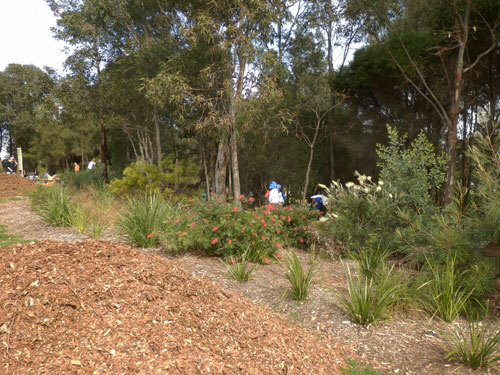 The community planted 26 species of plants, some of which were Acacia, Correa, Grevillea, Kunzea & Hakeas. Staff would have mulched & watered the area at the end of the event, which was a massive job. “For every hour we spend outside, we spend over 7 hours in front of screens watching television or on the Internet. Approximately 1 in 3 people spend less than 18 minutes per day doing outdoor recreational activities. 1 in 4 children under 16 years spend on average less than 2 hours of the spare time per week playing in natural outdoor areas. …people living in units or flats spend 3.5 hours per week doing outdoor activities, while those living in separate houses with large backyards spend 5.1 hours per week doing outdoor recreational activities. One in two parents said their children did not play in the gardens or bushland in an urban park. “1 in 4 children have never climbed a tree. With results like the above, events like National Tree Day & Schools Tree Day become extremely important in the lives of young people as this may be the first time they have planted something. They get to contribute & later see the results of their work. For kids who are essentially nature deficit, this kind of experience can be life-changing. I find it sad to see how disconnected to nature many children are these days. I spent many hours almost every day in my childhood running around fields & parks with my friends, playing with dirt, branches & rocks & whatever else we could find, building a cubby houses & hours spent sitting high in a tree with a friend gossiping about whatever grabbed our interest that day. We had school & home & outside time in almost even quantities. Today’s National Tree Day event was enjoyable & interesting. Having read the research I think it may have meant a lot more to those people who don‘t often get out into parks, or get their hands dirty. City of Sydney Council & Planet Ark went to a lot of trouble to ensure that there was something for everyone & that learning was passive & not at all threatening. It was a very good event. More planting at Sydney Park. Another area being planted. The people disappeared into the bush. 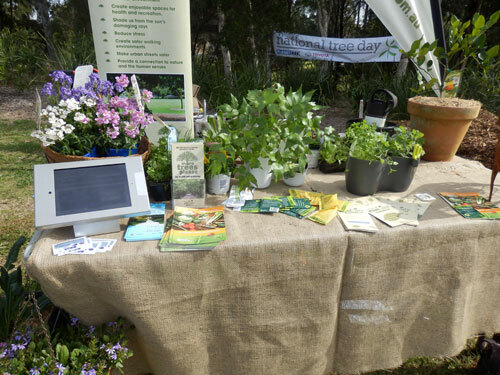 One of the displays on gardening in small spaces. 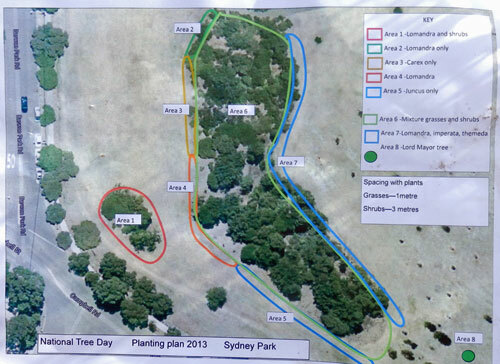 A map of today’s planting area in Sydney Park. As you can see it was quite a large area. I am always stuck by how beautifully green & leafy Erskineville is, despite the narrow streets. There is lots of shade on the streets & it is a very pleasant place to walk. 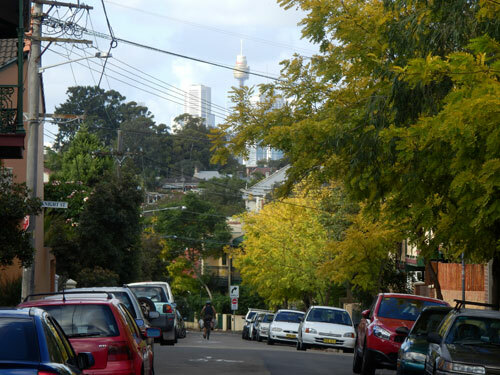 I was very happy to read of the City of Sydney Council’s new initiative to add more street trees into their LGA by allowing residents to not only choose the trees, but plant them as well. Called the Neighbourwoods Program, residents can apply for a grant of up to $10,000 “to offset the time & work involved in planting shade trees.” As I understand it, grants will be available for groups of neighbours to plant trees in their street. The residents can choose what species of tree they wish to plant & the trees don’t have to be natives. This may upset those who lobby for the planting of native trees only, but will please others who have a particular wish for exotics. I imagine the council sees this as breaking down people’s resistance to street trees if they are able to choose to plant what they like. I meet a lot of people who talk to me about street trees. 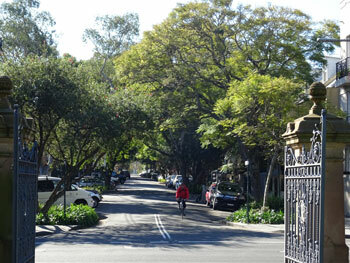 The overwhelming response is a dislike or even hatred towards deciduous street trees. We have thousands of these across Marrickville LGA, so that may amount to a lot of tree hatred. I am aware that deciduous street trees are planted to allow sunshine to get through during the winter months, but for me, street upon street of bare thin witchy branches makes for a bleak landscape. For others, deciduous street trees make for hours of sweeping & cleaning leaves off parked cars, with many doing this daily. When one or more residents desire a street clean of leaf litter while others don’t worry about the fallen leaves at all, this can result in simmering anger. I have been told many times of the “lazy” neighbour who doesn’t sweep up the leaves outside their place. Almost everyone I have spoken to who said that the tree is bad because it drops too much litter has also said that they wished the Council would remove it. Others don’t like natives & would prefer an ornamental tree or a tree from their homeland. Perhaps this is why we have so many street trees that have been pruned to remain short? A tree that is kept as a shrub is much easier to manage. I think that the City of Sydney Council’s idea to allow residents to choose their own tree species will be a hit. The fact that some may not choose to plant native species does not worry me because Sydney Council is planning to almost double their urban forest by 2050. I am sure that the Council will ensure that there are sufficient native food-producing species for urban wildlife & so any move from residents to plant non-native trees will balance out. 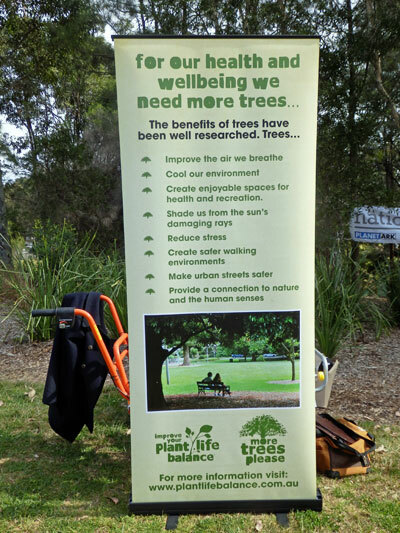 In addition to this new tree-planting program Sydney Council plans to plant trees in median strips, car parks & public spaces, as well include special trees in a Significant Tree Register. They also plan to educate the community on the benefits of trees. 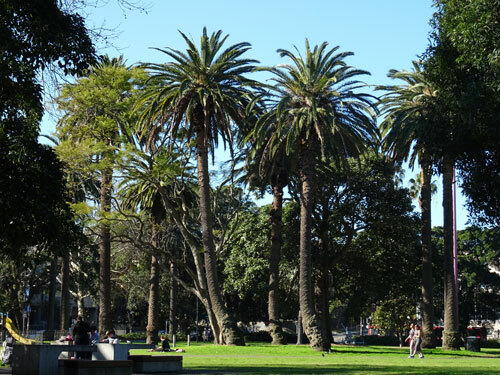 The City of Sydney Council also surveyed the amount of hard surfaces they have & plan to plant trees in these areas to lower the urban heat island effect. I love that Sydney Council’s focus is on shade trees. A street tree that only creates a minimal amount of shade around itself & does not shade a good part of the road will not have much of an impact in lowering the urban heat island effect. Maybe we will see more broad-leafed trees. 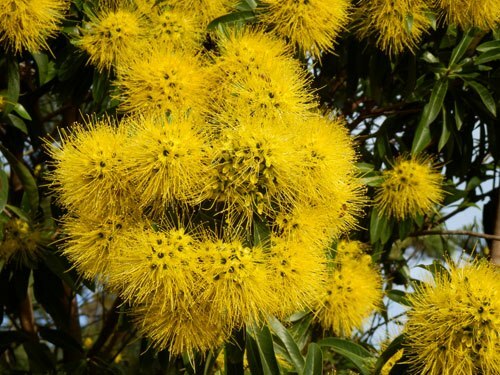 I discovered this gorgeous Golden penda – Xanthostemon chrysanthus – growing in Hurlstone Park the other day. I saw another growing as a street tree in Petersham as well. Seven street trees proposed to be removed in Mary Street St Peters. 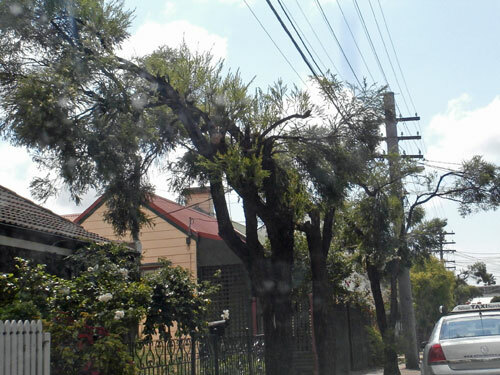 At the Council Meeting of the 20th November 2012 Marrickville Council sought permission to chop down 1,590 street trees that were dead, dying or nearing their Safe Useful Life Expectancy as identified by the recently completed Tree Inventory. Because of the large number of proposed tree removals I am listing the locations of the trees suburb by suburb. For brevity I have not included the species or the height of the trees to be removed. This information, plus more can be found in the above document. I have listed the street, followed by the house number the tree is nearest, finishing with the total number of street trees to be removed from that street in bold. At some addresses, more than one street tree will be removed. These are in brackets. 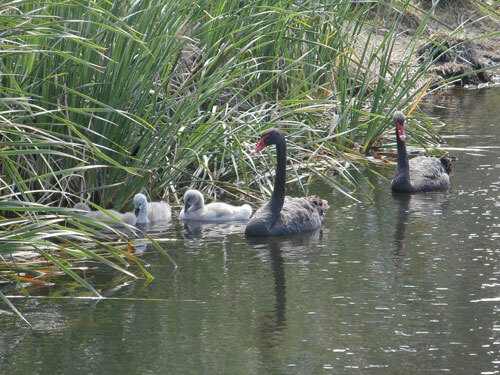 Parent Black Swans guarding the entrance to the ‘nursery’ while their babies sleep. It was wonderful to see this family swimming around a pond at Sydney Park. 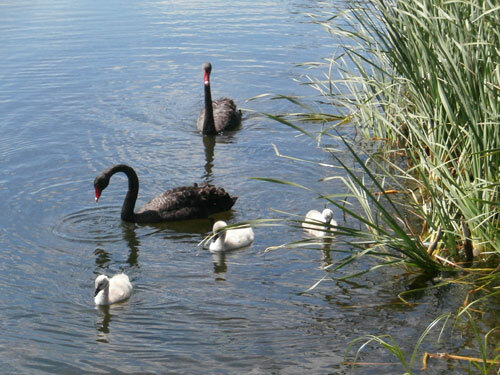 We were thrilled to see a pair of Black Swans & their three cygnets in one of the lakes in Sydney Park last weekend. The parent birds closely guarded their babies, at one stage corralling them into a section of the reeds that protected them on three sides so they could have a sleep. The parent Swans remained guarding the entrance to the reeds while also watching the people who were watching them. This is the first time I have seen cygnets. The story, ‘The Ugly Duckling’ is not true. There is nothing ugly about cygnets. We haven’t been to Sydney Park for a couple of years so it was nice to see just how much the trees & vegetation has grown. It’s obvious that the City of Sydney Council keep adding to this park. They haven’t just planted & walked away. Anyone know how many Fig trees in Sydney Park? I can imagine how glorious these will look when they have grown. 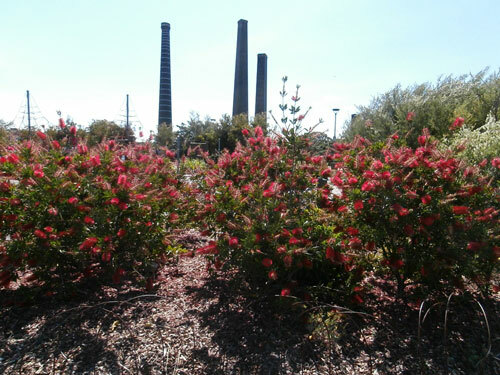 I was also impressed with the amount of colour, with Callistemon hedges & Grevillias dotted all around the park. I was pleasantly surprised to see & speak to a couple of Council Rangers who were cruising slowly around the park in their car. Also surprising was the lack of litter anywhere, including around the food kiosk. Even the toilets were clean. The people who use this park respect it, making me wonder why the same doesn’t happen along the parks along the Cooks River in Tempe & Marrickville. I wish it did. It was great to be in a park where one wasn’t confronted by lots of litter & black bags filled with dog poo. Sydney Park is a beautiful park. There are some very large trees & quite a few are flowering at the moment. I had the best toasted cheese & tomato sandwich I’ve had in years at the kiosk (they use real bread) & I was told that even the coffee was good. It’s worth going to see the swans & especially the cygnets. They are incredibly beautiful with their fluffy grey down & it is a joy to watch them. Look at this magnificent tree in full flower. There was lots of colour around, especially near the children’s playground. 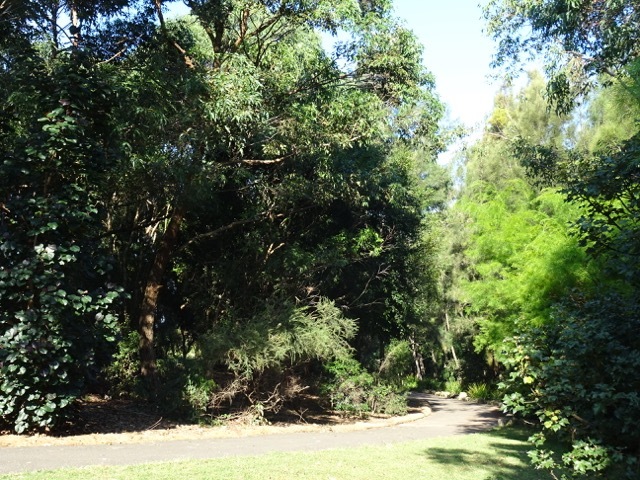 Sydney Park has great areas of trees – small urban forests. 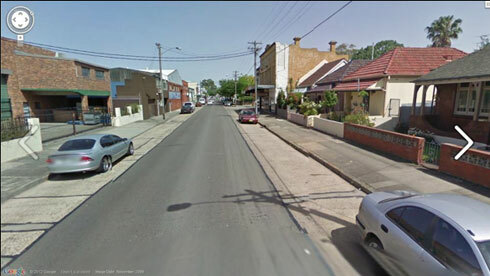 Google Street View image of one small section of Addison Road Marrickville. I know the City of Sydney Council have more money available to improve their streetscapes than does Marrickville Council, but for comparison & to show that it is both realistic & achievable, here is their latest example of improving life for residents & businesses in their LGA. It is part of their Greening Sydney Plan instigated by the Council, not a campaign/request from the residents. 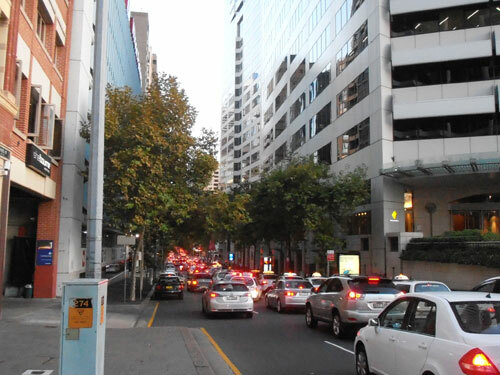 They are going to transform one of their busiest roads, Cleveland Street into a ‘living green boulevard.’ Sydney Council is doing this to encourage more people to shop & eat at the restaurants along Cleveland Street because they know a leafy outlook attracts shoppers. They are also greening the street for the health of pedestrians, residents & businesses. The Council plans to “improve the strip with better lighting, new trees, garden beds & green walls, new street furniture & wider footpaths” as well as plant a hedge of more than 900 plants to create an “attractive, leafy buffer between shops, residents, pedestrians & road users. The shopkeepers along Cleveland Street say that the greening of the street has already made a big difference to their businesses. Not Cleveland Street as I don’t have a photo. Instead Sussex Street Sydney as a comparison.